The building, built in 1909 was built with $25,000 from Andrew Carnegie for a new Baker City Library. It opened that year and has all the classic lines of a Carnegie library, stone outside, front steps, and the large librarian desk right as you enter the building. More than 100 years later, the building is now home to local artists, who hold classes, throw pottery, and display their work in a beautiful gallery space that still features the original windows and walls. After years of wear and tear, the building was remodeled and upgraded for six years, as the community found money to do the project. At one point it was empty, and then in 2008 enough money was raised to finish the major parts of the project. “There was a local gentleman named Leo Adler who made his money in magazines and when he died he set up a community fund that made sure projects like this one in Baker City got done,” Savage said. In fact through community giving and grants organizers were able to raise $1.5 million to finish the project, and today it’s a great place to visit. Each first Friday of the month, the gallery changes the displays to showcase local artists, in 2011 they are scheduled to have 18 artists. With adjustable lighting, nice floors and movable walls for art to be displayed, organizers can even take out the walls to show other media. 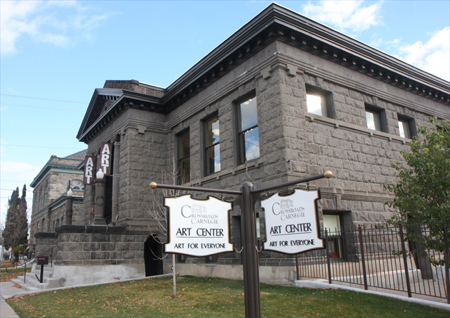 Savage, who works for the oldest art organization east of the Cascades in Oregon, said that the gallery is the cornerstone for other gallery space in Baker City. She also said that during events, she will coordinate with other gallery owners. Savage said the space could be used for meetings or family reunions. In addition, if you are visiting Baker City, there are chances to take a class or two or just use the studio space on the first floor – which includes kilns, pottery wheels and a theater space. Savage also said that if you want to have a tour of the building, volunteers are very willing to give one, if there isn’t a huge backlog of people. “This is a great success story about a community partnership,” she said. About Crossroads Carnegie Art Center: (From the www.crossroads-arts.org ) Crossroads Art Center was established to create opportunities for the entire community to be engaged, inspired, and transformed by the arts through participation in classes, workshops, exhibits, mentorships, and partnerships – a welcoming place where people meet and the arts speak. What to bring: Cameras are allowed in the building, and the gallery is an amazing space. Tip: The handicap accessibility is a little hidden, so if you need an elevator – the angle on the front steps is pretty steep – keep looking, it is around the corner. Make sure once inside you ask for the tour, because the staff is very adept at showing of the renovations that were done to the building. Season: The gallery is open year-round, however check the Crossroads Web site at www.crossroads-arts.org for information about classes, studio usage, tours and which artist is showing in the gallery. Getting there: For those navigating on “easy mode” just plug 2020 Auburn Avenue, Baker City into your GPS. For the rest of us Luddites, take Interstate 84 to exit 304 for Highway 7 and head toward the Geiser Grand Hotel, Historic District, Baker City Center. Turn right at Campbell Street, then turn left at Main Street. Turn onto Auburn Avenue and the gallery will be on your left.